Heavy duty stainless steel front and sides. Individually controlled stainless steel straight burners spaced every 6" at 15,000 BTUs each. Optimum heat distribution with heavy duty angled radiants, removable for easy cleaning. Angled radiants control flare-up while still imparting the charbroiled flavor. 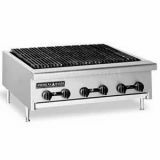 Heavy duty reversible cast iron 3" x 21" top grates, with grease runners to direct the run off to the removable grease trough, provides markings on the food. Full width grease pan removes for easy cleaning. One year parts and labor warranty.